“People say the hop flavour is like nothing you’ve ever experienced. Like the freshest hops but fresher, wonderfully aromatic and fruity, spicy and dank, subtle but in-your-face all at the same time. It’s a beer that manages to quench your thirst but still makes you want to drink more, an impossible feat made possible. It’s sweet but not too sweet, bitter but not too bitter, it tastes full and thick but it’s light and sessionable. You could easily drink four or five in an evening and wake up hangover free; but at the same time, people happily sip a single glass all night long. If you ask me, and most people do, it’s the best beer ever made”. He took a long deep breath, slowly exhaled and slumped down in his chair. “Hold that thought!” I said, dashing off. I’d only been gone a minute or two. Had broken the seal, you know how it is, but by the time I got back he was gone. He’d been sitting there all night, chatting away to anyone that happened to look interested, but he chose then to leave, right when it was getting interesting! Crazy old bloke, muttering on about this beer he’d once had, best beer in the World apparently. LEGENDARY. Perfect, he said. Of course, what he didn’t say was who bloody made it! Or what it was called for that matter. How can the perfect beer exist anyway? Impossible. Looking back on it now he was probably just making it up. But he planted a seed in my mind that refused to stop growing. I’ve drunk a lot of beer since then, probably more than my fair share, but I still haven’t found it. At times I’ve worried I take it all a bit too seriously, y’know, it is only beer at the end of the day. I’ve noticed a lot of my mates do it too though, they might not’ve been there when I met that bloke but they seem to know about the beer. Somehow they seem to know. I’ll sit there in the pub and watch them do the same things I do, that’s how I know they know. They’ll take that first sip of a pint and then their faces give them away. They’ll put the glass back down and then there it is, written on their faces: slightly too bitter, could do with some more roast flavour, nice, good, great, but never perfect. Yeah, I’ve come close a few times myself. Course I have. I remember walking off the beach after a day in the Sun, being met by an ice cold lager in a frozen glass, thinking to myself: there’s nothing I’d rather be drinking. I remember once sitting around a campfire with all my mates, we’d just polished off this awesome barbecue and then Dave broke out this smoked beer from Germany, it tasted like the atmosphere around us had been condensed, concentrated and forced into a bottle, it was incredible. And yeah, before you ask, there was a time, one time, when I though I’d found it. It was this dusty old bottle, years old it was, a mate found it in his loft underneath a load of old crates. He gave it to me and said something about it being a ‘ten ninety five gravity’, not that he had any idea what that meant, he just said that’s what the crate had written on it and that it belonged to his old man. Lager drinker you see, he had no interest in it so he just gave it to me. I remember looking at it for markings or clues, anything to point in the right direction. I feel embarrassed about it now to be honest; I got annoyed and chucked the bottle out when I hit a dead end. Maybe someone else would’ve seen something on that bottle that I missed, the shape of it, the maker of the cap, something. Who knows? All I know is it’s the closest I’ve ever got. Lovely it was, beautiful to look at, perfect condition even after all those years, fantastic fruity hop flavour and bags of chewy malt, wonderfully sweet yet balanced by a punchy bitterness. Like I say, I thought it was perfect at first, at first, but then it built on me and the body just felt a bit thin, a bit thin to carry that flavour for the length of the glass. So close. So close. Found your blog on the BBC registration list. I am randomly surfing that list. I completely agree with you about surroundings and the beer you're drinking - it can make a massive difference. 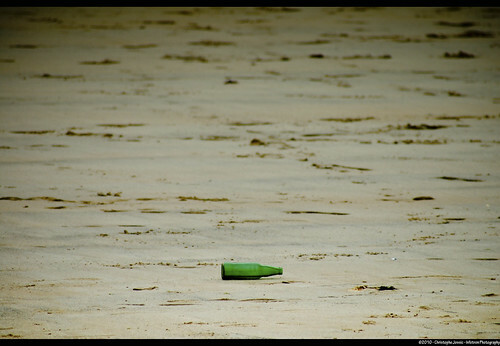 That reminds me of a bottle I found last year, buried deep in my garden of all places. The label was gone, but there was foil round the lid. It wasn't terribly drinkable, and had probably been there for thirty years or more, but I've kept the bottle in case I can ever identify it.